For an official count of a specific provider list available for purchase, contact us here. We can provide lists based on type of provider, specialty, subspecialty, zip code, geographical radius, city, state, gender, and many other criteria. Scroll in the panel below to view the full list of taxonomy codes. Select a state from the SELECT STATE dropdown box below, and click the GO button. The count of each healthcare provider specialty and subspecialty, and healthcare organization type, will appear in the large blue panel. Use the FIND box to look for specific specialties, subspecialties, and facility types, and find the taxonomy code associated with it. Enter a partial code or fragment of the description, and click FIND. Click Find again to find the next match. Select "ALL" in the Select State dropdown to display composite counts of all 50 states, DC and PR. NOTE: The taxonomy code is hierarchical; you may select just the first few characters of the taxonomy code to indicate all specialties and subspecialties within that specialty group. Sorry, your browser does not handle frames. Go here to see healthcare provider specialty counts by state. 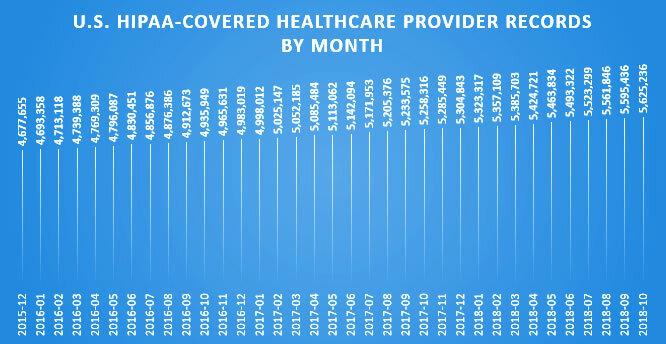 If you don't see provider counts just above this line, click here to find state-by-state healthcare provider listings that will work with your browser. For information on ordering custom lists, please contact us. To see a comparison of our exceptionally affordable off-the-shelf databases, visit this link. The chart below shows quarterly growth rates for the past eleven quarters, and a projection for growth in the last quarter of 2018. Notice the cycle, with the most new provider records In the second quarter, and the least in the first and fourth quarters. This cycle correlates with the medical program graduation cycle.